Bonus Matashu points to a three-ton truck he bought for $15,000 in cash and says President Robert Mugabe’s often violent program of seizing white-owned farms and giving them to black Zimbabweans turned around his life. Matashu, 34, was allocated land by the government in 2001 after a white-owned farm was seized and its former owner emigrated to South Africa, he said in an Oct. 18 interview. He grew cotton for a decade before switching to tobacco. This year he earned $34,000 and won an award for being the best small-scale tobacco farmer in Karoi. 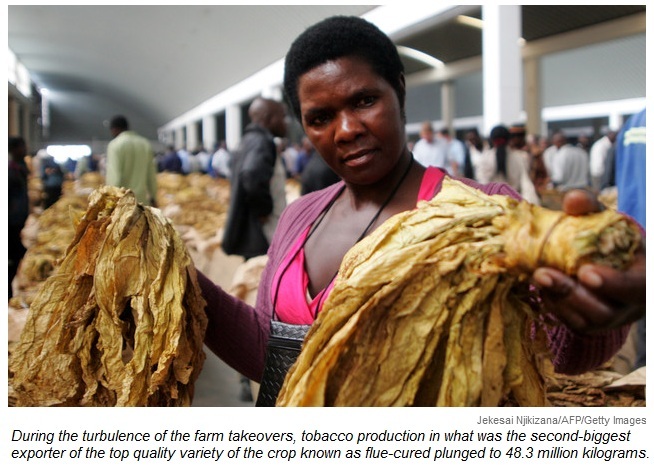 During the turbulence of the farm takeovers, tobacco production in what was the second-biggest exporter of the top quality variety of the crop known as flue-cured plunged to 48.3 million kilograms in 2008 from a record 236.7 million kilograms (521.8 million pounds) in 2000, according to the Zimbabwe Tobacco Association. Now it’s making a comeback, with this year’s 166.7 million kilograms earning about $612 million. Mugabe said he embarked on the land-grab program in 2000 to address the expropriation of land from blacks during the 90 years of white rule that ended after a civil war in 1980. While it helped him win rural votes and retain power, the economy was gripped by a decade of contraction, with plummeting exports of crops ranging from tobacco to roses. About 18 white farmers were killed in violent takeovers of their land while almost all of the country’s 620,000 permanent and seasonal farmworkers were driven away from their homes, John Worsley-Worswick, the head of of Justice for Agriculture, a Harare-based lobby group, said in an interview on Oct. 28. Together with dependents those workers accounted for 2 million people, he said. Most of the rest Zimbabwe’s agricultural industry remains in crisis. The rose export business, formerly worth $87 million a year, has largely disappeared. Once a corn exporter, Zimbabwe has regularly imported the grain in recent years, buying almost 97,000 tons from South Africa since the beginning of May. That’s the most in a single season since at least the marketing season that ended in April 2010, according to South African Grain Information Service data. The tobacco industry no longer resembles the pattern of large, white-owned, farms, which have been seized and resettled. In 2000 the crop was grown by 1,500 large-scale farmers while 5,000 small-scale growers produced 3 percent of the crop. This year 110,000 small-scale farmers grew 65 percent of the crop, according to the government’s Tobacco Industry Marketing Board. While most of the tobacco used to be auctioned most is now grown under contract for leaf merchants. Companies including Universal Corp. (UVV) and Alliance One International Inc. (AOI) but the crop. More than a fifth of the growers were registered this year, and farmers are being encouraged to grow the crop in the more arid region of Matabeleland, where little tobacco has been produced before. “It took the minority more than 50 years to reach 220 million kilograms,” said Lovemore Chikweya, regional coordinator for the TIMB in Nyamandhlovu, 370 kilometers southwest of Harare, in an interview. “With these new farmers that number can and will be surpassed within five years,” he said, forecasting production at 200 million kilograms in 2014. With the violence associated with the land reform program and a series of disputed election resulting in sanctions targeting Mugabe and his allies from the European Union and the U.S., Zimbabwe’s tobacco farmers are now exporting more of their crop to Asia. This year Chinese buyers acquired $197 million worth of tobacco while Belgium bought $102 million, according to the TIMB.